It’s been almost 50 years since Ken Buchanan travelled to San Juan, Puerto Rico to become WBA World Lightweight Champion. The Edinburgh fighter upset the odds to beat Ismael Laguna after 15 gruelling rounds on September 26, 1970. After Saturday, Josh Taylor has earned himself the right to try and emulate Buchanan with a points victory over Viktor Postol to set up a shot the WBC Super-Lightweight title. Assuming he beats fellow American Danny O’Connor as expected the weekend after this, Jose Ramirez will be Taylor’s opponent. Like Buchanan, Taylor is almost certain to travel overseas in his bid to bring back the belt, with New York seeming to be the preference of manager Barry McGuigan, given Ramirez’s popularity on America’s west coast. He sees no reason why the 27-year-old can’t go and win in Ramriez’s back yard, especially given the backroom support Taylor benefits from that just wasn’t there in Buchanan’s day. 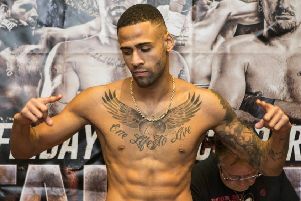 “One of his heroes is Kenny Buchanan who went to Puerto Rico and won the world title, then unified it in Madison Square Garden,” the Cyclone Promotions boss recalled. “Josh would love to do something like that. I think Ken was unfortunate in that he didn’t have enough backing and support over here, so he had to travel. Josh is not in that position. We have a television company behind us and a number of other irons in the fire. We can’t cut our nose off to spite our face – we’ll look at all the possibilities and see what’s best for Josh. Postol was easily the most difficult test of Taylor’s 13 professional fights, although McGuigan believes that seeing someone really compete with his man can only be good in terms of attracting both bigger crowds and previously uninterested opponents. “The crowd could’ve been better,” he admitted. “It’s the wrong time of the year, in the middle of the Word Cup, people are on holiday – it’s just a difficult time to sell.